gourmet in the hands of skilled chefs; it also has a spa area with a steam bath, tepidarium, for an amazing holiday. 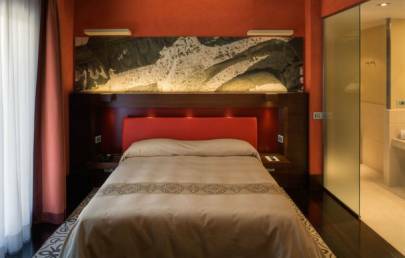 Perfect for those who want to visit the Salento area without giving up the comforts and the attractions of the big city. 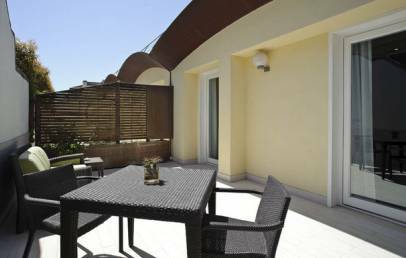 The Risorgimento Resort is located in one of the most picturesque corners of the ancient baroque town of Lecce, not too far from the bell tower of Piazza Duomo and from the roman amphitheatre of Piazza Sant'Oronzo. Charming suggests you to rent a car to reach your desired hotel. The hotel, created from the renovation of a beautiful historic building of 1880, stands up for the refined materials and the care and attention to every detail. The restoration has been realized fully respecting the building historicity; the hall reminds a walk in the old town, thanks to the benches, the craft workshops and the libraries. 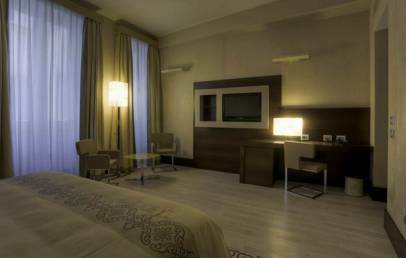 The 41 rooms and 6 suites provide every modern comfort: air condition, mini bar, radio and TV. The design rooms are also decorated with elements that recall the country, mixed with modern elements. The bathrooms are finished in marble and offer a large space; the carpets recall the stylized designs of olive trees and the large graphic prints curtain retract details of the Baroque of Lecce. To relax body and spirit, nothing is better than a visit at the “Spa Salus per Aquam”, a peaceful oasis. Guests can benefit of several wellbeing massages combined with beauty treatments and enjoy the pleasant heat of the hammam and the sensations of the emotional showers. At the Risorgimento Resort guests can enjoy the gourmet food and wine traditions of Apulia at the “Le Quattro Spezierie Gourmet Restaurant & Roof Garden”, where the Executive Chef Cosimo Simmini proposes savoury specialties, prepared with local products and seasonal ingredients for meat and fish as well as delicious desserts. At disposal of the guests there are the following services: fitness centre, wireless in public areas, business centre, parking place. 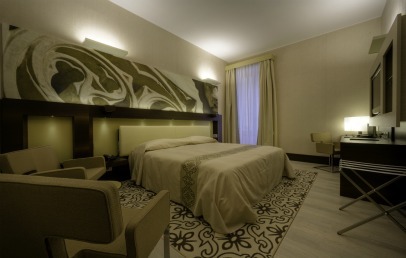 Bright and elegant double room covered with parquet o carpet. Over the headboard of the queen size bed there is a typical Baroque detail. 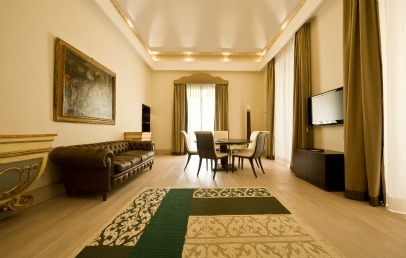 The refined furnishings are characterized by beige green and brown colours. The bathroom, with shower and bathtub, is covered with precious marble from Iran. Some Superior rooms have a sublime view of the city. 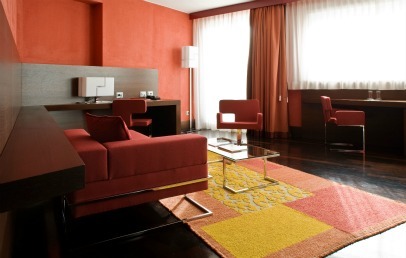 Stylish double room with precious furnishings and fabrics in warm colours. 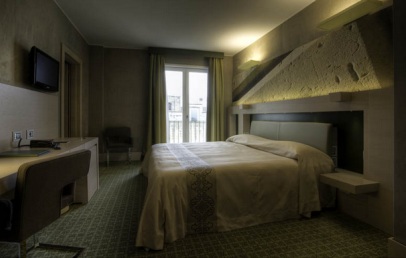 Some rooms are in relaxing olive green with carpets that have designs of branches of stylised plants while other Deluxe have a parquet floor. The bathroom, with shower and bathtub, is covered with Imperial white marble. Double room in contemporary style. 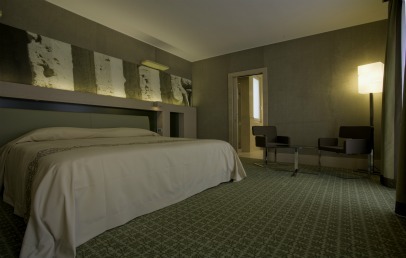 The carpet is characterized by stylized olive trees while over the headboard there is a detail of the city’s baroque churches and buildings. It consists also of a lounge area with table and armchairs. The bathroom, with shower and bathtub, is covered with precious marble which looks like the typical Lecce stone. Some Executive rooms have a city view, the others face the patio of the hotel. 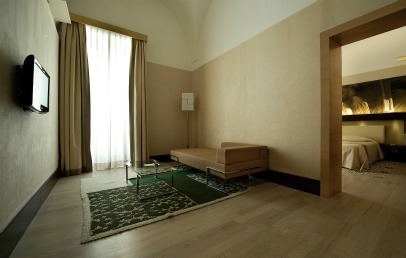 Large and cosy Suite characterized by bleached oak parquet flooring and by a wallpaper which make this suite particularly elegant and welcoming. The refined bedroom presents, over the headboard, a typical Baroque detail. It consists also of a living room with a sofa, a hand-made 18th-century carpet and a 32" LCD TV. 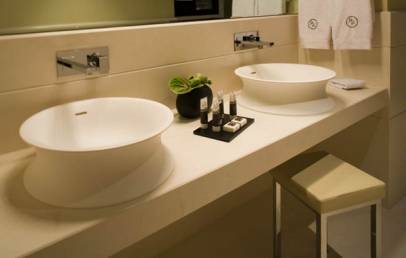 The bathroom, with shower and bathtub, is furnished with hairdryer, bathrobe, slippers and toiletries with personalised fragrance. The Junior Suites offer a splendid views from the large windows. 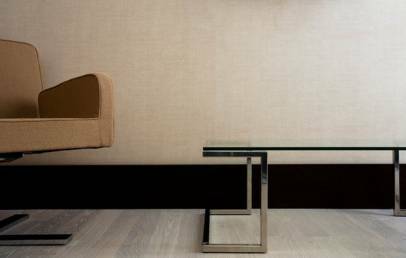 Sophisticated Suite, finest furnished in all details. The night area presents a king-size bed with an original decorative canvas showing details of Lecce baroque, a glass walk-in closet and a 32" LCD. The living room has comfortable seating, a Wengè desk with Internet and a 2nd 32" LCD TV. The bathroom, with shower and bathtub, is entirely in precious Iranian marble. The private terrace is ideal for breakfasts or dinners and offers a stunning views over the city. 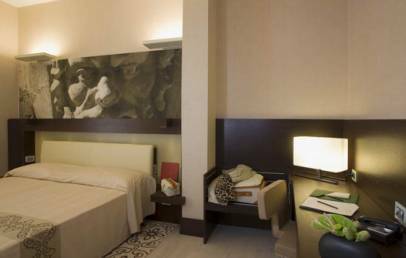 Prestigious and finest Suite characterized by a large double room with a Wengè headboard, a canva which represents a Lecce baroque detail and a glass walk-in closet. 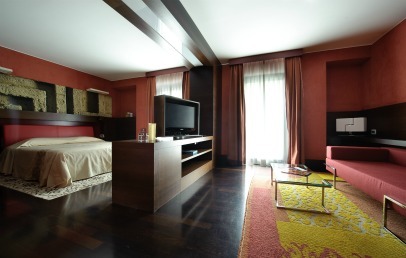 The living room is furnished with comfortable seating, a desk and a 42" LCD TV with radio and dvd player. The bathroom, with shower and bathtub, is entirely in precious Imperial white marble. Finally, there is a Jacuzzi area with a large twin tub, which faces on the private terrace. It is fully equipped with sun beds, couches, tables and armchairs. The city view terrace is the ideal for breakfast or intimate dinners. 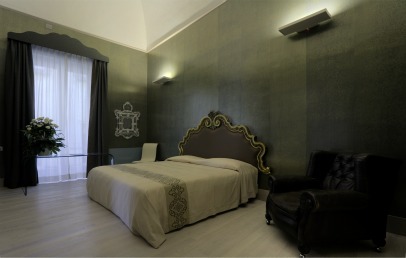 Exclusive Suite dedicated to the Lecce-born tenor Tito Schipa. The large bedroom presents a king size bed plus, 2 wardrobes and a stylish desk. The living room is characterized by original frescoes and furnishing dated back to late 19th-century. The private bathroom has shower and bathtub. Thespacious private terrace is fully equipped and ideal for breakfast and dinners thanks to the Roman Amphitheatre view.